I’ve had a lot of second-favorite bands over the years … Boxer Rebellion most recently, Collective Soul before that, etc. But I’m here to report that today, for the first time in 35 years, U2 has become my second favorite band. They’ve been replaced by Gang Of Youths, an Australian band (now based in London) with two albums and an EP, and I can’t get enough of them. I have the same feels for Gang Of Youths that I had for U2 in 1983/84. I want to watch all the videos, read all their articles and interviews and just dig in to their music as much as I can. And that’s what I’ve been doing, as evidenced by my Last.fm listening chart — this one shows the albums I’ve listened to the most over the past 90 days. Over the years that I’ve been a U2 fan, there’ve been all kinds of bands that were supposed to be the “heirs to the throne” after U2 … Radiohead, Coldplay, Muse, The Killers, Kings Of Leon, etc. 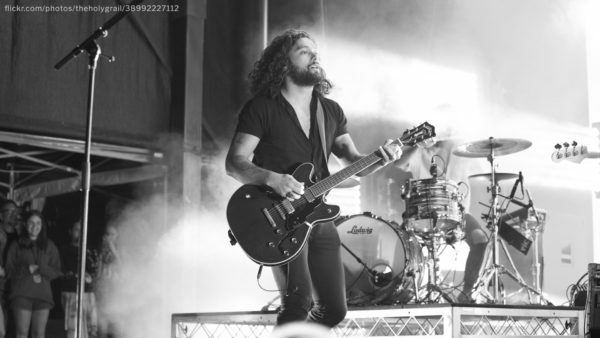 But for my money, Gang Of Youths is the band that can make the most legitimate claim to that title. I’ve been trying to convert everyone I know to become a GOY fan, so I figured I’d make a list of things you should know about them — plus all the reasons I love them — and then I can just share this article in the future. I think the best songs tend to come from pain. That’s why I’m so attracted to Achtung Baby, and also why I love a lot of Gang Of Youths’ songs. I’ve never been a big lyrics guy, but the honesty and candidness of this band’s lyrics are utterly compelling. He wears his heart on his sleeve, as the saying goes, and screw you if that makes you uncomfortable. He’s not trying to be cool, and I love that. “Fear and Trembling” is the first track on their latest album, Go Farther In Lightness. The song references and borrows its name from the Soren Kierkegaard novel. The song “Atlas Drowned” is written as a response to the themes Ayn Rand wrote about in Atlas Shurugged. “Achilles Come Down” references the Greek mythological hero. The chorus of “The Deepest Sighs, The Frankest Shadows” mentions “the unbearable, terrible triteness of being,” a play on words related to the Milan Kundera book, The Unbearable Lightness of Being. The song touches on some of the book’s themes. This same GOY song also references Sisyphus. In addition to the literary references, Le’aupepe uses words like “solipsism” (in “Let Me Down Easy”) and “simpatico” (in “Do Not Let Your Spirit Wane”) and “ephemera” (in “Say Yes To Life”) and “emulsified” (in “Keep Me In The Open”). I love a band whose lyrics make me open a dictionary or try to remember back to my English Lit classes in high school and college. Look, I don’t know how else to describe this, but I just think these guys have written some incredible songs and they play them with fantastic musicianship. I’ll try to limit this to just a few…. Wanna Give Them A Try? One of the cool things is that every week seems to involve a new discovery of a song that I love. It’s like a musical Christmas with a new gift the more I listen. “Do Not Let Your Spirit Wane” was my first favorite, for reasons that I’ll explain in a separate blog post that I’m struggling to finish. “The Deepest Sighs, The Frankest Shadows” was my next favorite, and probably still is … it’s my “new Streets,” the song that lifts me up the way “Where The Streets Have No Name” has lifted me up for a couple decades. “Still Unbeaten Life” is a slow gem that I adore. “The Heart Is A Muscle” is kinda cheesy but in the best way possible, and I went through a stretch where it was a fave. Ditto for “Radioface.” Right now, “Keep Me In The Open” is the tune I can’t get enough of — not my overall favorite, but it’s this week’s gift. One note as I wrap up: If you DO spend some time listening to these guys, you’ll quickly find out that Dave L. is a pottymouth; lots of their songs are labeled “explicit” on Spotify. That might’ve bothered me 10-20 years ago, but at the ripe age of almost-50, I have a major case of DGAF when it comes to stuff like that. Your mileage may vary. I don’t know if this is a permanent change atop my “favorite band” list, but I’m not gonna worry about it. Just enjoying the music and discovering as much as I can about this new (to me) band. So if you see me tweeting incessantly about Gang Of Youths, now you know why.